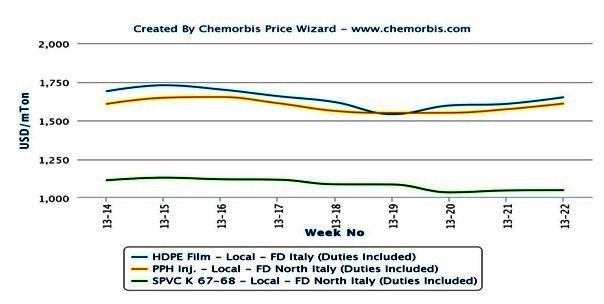 PP, PE and PVC markets in Italy recorded relentless decreases since April amidst muted demand owing to volatile economic conditions in the country and bearish upstream chain in Europe as per the pricing service of ChemOrbis. However, the trend shifted upwards in the second half of May with support from supply constraints for certain products and widespread talks emerging for hike intentions from sellers regarding June. On Wednesday, June propylene and ethylene contracts settled with modest increases over May, for the first time in three consecutive months. New propylene contracts settled up €15/ton while ethylene settlements indicated €5/ton increases for the new month. The latest development disappointed sellers who previously voiced stronger expectations about the settlements. Nonetheless, closing their May sales earlier than usual, sellers pioneered hikes heading to the end of May with their firmer stance being felt for PE and PP the most. Sellers in those markets lifted their offers with respect to initial May levels given generally limited availability. This week, price increases for June delivery PE cargos spiked €90-100/ton, while €30-70/ton hikes passed on PP deals from initial levels for May. In the PE market, a packaging converter could get only 2 orders out of 6 orders of South European LDPE he asked for in the beginning of May. “We had to pay an €100/ton increase compared to early May,” he lamented. A trader increased his PP prices for late May since his regular West European supplier issued €70/ton hikes with respect to the first half of the month in addition to €50/ton hikes he received from his South African supplier. “We heard about possible hike requests in June. Meanwhile, our European source claims to have some supply concerns,” he noted. A food container manufacturer purchased some homo PP volumes paying €30/ton hikes from two weeks ago as he was warned about additional hike attempts. In the PVC market, a distributor of a Central European supplier offered €30/ton increases for June over May. “Our producer aims for price hikes regardless of the ethylene settlement,” he mentioned. 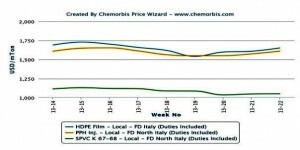 According to ChemOrbis, firmer price announcements are expected from PP, PE and PVC sellers in Europe regarding June as producers want to recover their margins following drops in the previous couple of months. These intentions are now supported by slightly firmer feedstock costs. On the other hand, the small increases in olefin contracts may keep hike amounts in check for next month. Sellers may have to step back from their initial hike requests in case demand doesn’t support the currently sought increases, according to buyers.